Sandrine Giroud joined LALIVE in 2009 and is a partner of the firm since 2017. She specialises in domestic and international litigation, with a focus on commercial disputes, fraud and asset recovery, white collar crime, mutual legal assistance in civil and criminal matters (including extradition), art and cultural property, trust and estate, media law, as well as public international law (including immunities from jurisdiction and enforcement) and human rights. 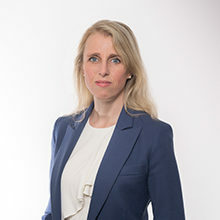 She regularly advises and represents companies and individuals in the recovery and protection of their assets through provisional measures, freezing orders, recognition and enforcement of foreign judgements and awards, cross-border insolvency proceedings or execution of contracts as well as compliance procedures and internal investigations. As part of her practice, she also represents collectors, art market professionals and museums on dispute resolution and transactional matters in art. Her experience in the management of particularly sensitive matters allows her to tackle not only legal but also strategic aspects such as reputation and media. Sandrine Giroud is a member of various professional bodies namely the Geneva Bar Association (ODA), the Swiss Bar Association (FSA/SAV), the International Bar Association (IBA), the Society of Trust and Estate Practitioners (STEP) and the Geneva Association of Business Law (AGDA). She is a member of the Executive Board as well as President of the Human Rights Committee of the Geneva Bar Association (ODA). She also acts as officer of the IBA Litigation Committee since 2015. Passionate about art, she is a member of various organisations in this field such as the board of the Swiss National Museum, the Board of the Art Law Foundation (which she has co-directed from 2014 to 2017), the Task Force of the Responsible Art Market Initiative (RAM), as well as the Professional Advisors to the International Art Market (PAIAM). She is a regular speaker at international conferences and frequently publishes on matters related to her fields of expertise. Sandrine Giroud is recognised as an expert by Who’s Who Legal in Litigation, Asset recovery and Private client as well as by Legal 500 in Litigation and Banking and finance. Before joining LALIVE, Sandrine Giroud worked as a legal adviser at the Swiss Federal Office of Justice in Berne (2006-08). She graduated from the University of Fribourg (2003) and studied at the University of Bristol (2000-01) as well as at the International Humanitarian Law Unit of the University of Nottingham (2004). She also holds an L.L.M in International Dispute Resolution issued jointly by the University of Geneva and the Graduate Institute of International and Development Studies (2009) and a STEP advanced certificate in the law of trusts (2012). Sandrine Giroud is held in high esteem as “one of the top people” in the Swiss market for complex banking disputes and cross-border enforcement cases. Ranked among the world’s leading asset recovery practitioners. Ranked as a leading figure in Litigation. Sandrine Giroud “has an excellent reputation within the market” as “an expert in the field of asset recovery with expertise in both civil and criminal fraud”. She is highlighted for her “thorough and diligent” approach. "Effective" litigator Sandrine Giroud is recommended. Sandrine Giroud among the top practitioners in Switzerland. Sandrine Giroud is an “outstanding” practitioner with a wealth of experience handling multi-jurisdictional litigation, with notable expertise in banking and trusts matters. Sandrine Giroud highlighted as a next generation lawyer. Selected among Top 100 Women in Investigations. In: Lein et al. (Eds. ), Collective Redress in Europe – Why and How?, British Institute of International and Comparative Law, London, 2015, pp. 481-503. Le Règlement Bruxelles I bis, un modèle pour une nouvelle Convention de Lugano ? Take the survey: should art lawyers be the vigils of the art market? Lettre soumise aux réserves d’usage: une preuve illicite? The Protection of Financial Investors: The Road to a Collective Redress Mechanism in Switzerland? The Weber Initiative: The End To Chalets In The Swiss Alps? In: Denis Campbell and Christian Campbell (Eds. ), International Civil Procedure, 2nd Ed., 2011, Juris Publishing, Inc.
A Swiss Perspective on West Tankers and Its Aftermath: What about the Lugano Convention? État de droit et confiscation internationale : Quels enjeux pour l'État helvétique ? For more information, see the presentation. Sydney 11/10/2017 Sandrine Giroud Speaker: Towards global corporate criminal liability? Zurich 05/05/2017 Sandrine Giroud Conference co-chair and speaker: Artificial intelligence – How much of you will it replace? How much will it enhance? Geneva 26/01/2017 Sandrine Giroud Organiser and speaker: What is the Responsible Art Market Initiative? For more information, see the programme 1 and the programme 2. For more information, see the programme and the report on the session. For more information, see the invitation and the presentation. La Grande Table - Le prix d’une œuvre d’art : le tabou ! For more information see the programme. Paris 10/12/2015 Sandrine Giroud Speaker: Les méthodes alternatives de résolution des litiges et mondialisation : peut-on échapper à l’uniformisation des pratiques ? London 27/03/2015 Sandrine Giroud Speaker: How and where to structure an art collection? How best to pass on a collection through generations? Milan 12/09/2014 Sandrine Giroud Speaker: Brussels I Recast: What about Arbitration? Montreal 16/05/2014 Sandrine Giroud Speaker: Obtaining evidence abroad: How I can help you? For more information see the presentation. Freezing and Restitution of Illicit Assets of Politically Exposed Persons: A Swiss Solution? For more information see the programme and the presentation. Geneva 14/08/2012 Sandrine Giroud Speaker: Rubik & the Final Withholding Tax – Quid with the Trusts? For more information, please see Ms Giroud’s presentation. For more information, see the flyer and the programme. For more information, see presentation. The Lugano Convention revised: What's new?